Have you won a Centrepiece Rosette? Would you like to win one of Rosette Display Hangers? Simply send in a photo of your rosette made by Centrepiece (there will be one of our labels on the back so you will know its ours!) and you could be the monthly winner. 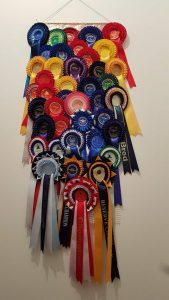 Rosettes will be featured on our website and one monthly winner will be chosen by an independent judge to win one of our hangers. Get snapping now and send the photo into [email protected] via email, we will save them and publish them on our website so make sure that you keep checking back here to see your rosette featured. Tell us a little story about how you won the rosette, your horses name etc so we know all about you.